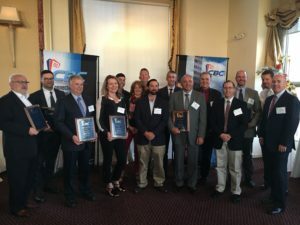 6/25/2018 – The new Litchfield Judicial District Courthouse was named Project Team of the Year and also earned First Place for the New Construction category by the Connecticut Building Congress (CBC) at the organization’s awards dinner on June 12, 2018 at the Bond Ballroom in Hartford. 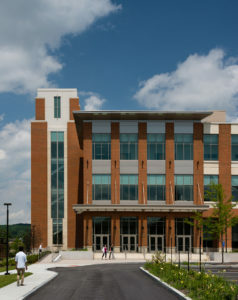 The Courthouse was a Design-Build project between KBE Building Corporation and the DLR Group. 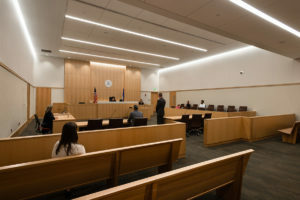 Designed as a 75- to 100-year building, the 183,000 sf complex offers a perfect union of judicial functions previously dispersed throughout the county: juvenile court, criminal court, family court, and civil court. Areas for probation officers, district attorneys, and other court support functions are now located within the facility. Enhanced security features, technology, high-end millwork, imported tile floors, acoustical systems to achieve sound absorption, and a design aesthetic that evokes the monumentality of the space are all part of the finished building. Each courtroom type features a different design aesthetic befitting its function. The awards program recognizes outstanding building projects that exemplify project team excellence and represent the best practices in teamwork by project owners, architects, engineers, construction managers, and trades. The Project Team of the Year award recognizes the project that stands out above all the rest.